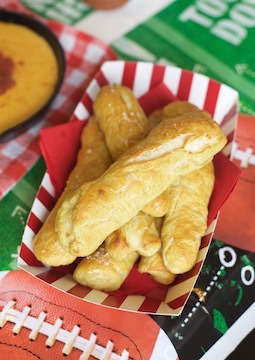 When tailgating or watching the game at home with kids, it's fun to make some snacks that are geared toward them, so they feel included. These snacks are absolutely grown up approved, too! As a kid, football was the soundtrack of fall in our house. My dad grew up in the San Francisco area, so he and my brother always get so fired up about NFL games, especially when the 49ers do well. As a teenager, Friday night football was the highlight of the week. The school week was done, and everyone gathered at the Conway High School stadium to cheer on the players and have fun with friends. Now, as an adult, football to me is all about the food! It's about getting together with friends, food and drinks, and cheering for a common goal (like the Razorbacks winning)! Who doesn't love a hot, fresh-from-the-oven soft pretzel? Nacho cheese dip is also a game day staple, and the two are dreamy together. A fun way to get the kids involved in the game is to let them choose which team they want to root for, and top some popcorn with M&M's that match their team's color! The Nutella footballs though are (not surprisingly) always the biggest hit with my kids. There are apple slices on top, so that makes it healthy, right? My personal favorite game day snacks are cauli-tots! These are a really great way to introduce your kids to cauliflower, because these snacks are no boring veggie. Warm, crunchy on the outside, creamy in the middle tots are made with cauliflower and loads of cheese, then baked in the oven. The best thing about them is that, unlike football, you can choose any kind of cheese and you're still guaranteed to win every time! I love creating memories, and football season is a great time to do just that. Stir together warm water, sugar and yeast in the bowl of a stand mixer and let sit 5 minutes until it starts to foam. Add the salt, then slowly add the flour, then add the warm milk. Using the dough hook attachment, knead until dough comes off the sides of the bowl. Cover bowl with damp dish towel and let rise until doubled in size, about an hour. Preheat your oven to 475°F. Punch down the dough and then coat your hands in flour. Take a small handful of dough and roll it into a 6-inch rope. Repeat and line them up on a cookie sheet, and let rise another 15 minutes. While rising, bring 6 cups of water to a boil, and then add the baking soda. Slowly drop the pretzel sticks into the boiling baking soda water for 1 minute, then transfer back to the baking sheet. Brush with the melted butter and sprinkle with the coarse sea salt. Bake for 10 minutes, until golden brown. Brush again with melted butter, if desired. Best served warm, and can be eaten alone or with mustard or cheese dip. Melt butter over medium-low heat. Whisk in flour until combined into a smooth paste, then slowly add the warm milk (cold milk will separate the sauce!) and whisk until smooth. Add spices, whisk again, and then add the grated cheese. Stir until sauce is smooth (add more warm milk a spoonful at a time if you like your dip thinner). Serve hot! This will thicken/harden as it cools, so serve quickly or keep in a hot skillet or small slow cooker. Great with tortilla chips or soft pretzels (or anything edible). Chop the cauliflower and then steam it until soft but not mushy. Transfer to a food processor until blended. Spoon into a bowl, and add the breadcrumbs, the spices, the egg and the cheese (and herbs, if using). Stir until combined, then chill in the refrigerator for 30 minutes to an hour. Preheat oven to 375°F. Spoon a small amount (about 2 teaspoons) of mixture into your hand and roll it into the shape of a tater tot. Coat in thin layer of panko until it's not sticky anymore, and place on a greased cookie sheet. Bake at 375 for 25-30 minutes, turning over halfway through. Serve hot. Using a football-shaped cookie cutter (or a knife), cut out a football shape in each slice of bread (I got two footballs per slice). Smooth a couple teaspoons of Nutella over the top. Using a sharp knife, cut a chunk of the apple, and then slice a few long sticks. Make one stick the center of the “football stitching” and then cut smaller sticks for the side stitching. Easy peasy! Top individual servings of popcorn with your favorite team's colors!